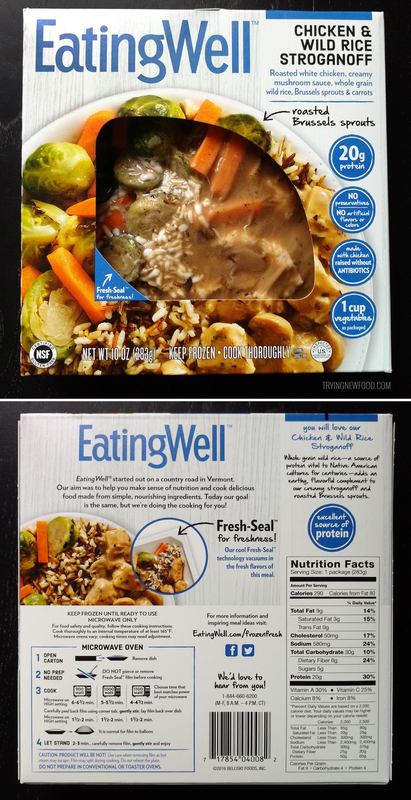 Picked up the new EatingWell Chicken & Wild Rice Stroganoff and got to see if it would be as tasty as other EatingWell meals we’ve tried. Trying something a little different than my previous posts and stacking the front and back photos of the packaging so that all the details are larger. Now you can read everything better — hooray! Just like the others, this features Fresh-Seal™ technology that vacuum-packs the contents, which are visible through the cutout on the front. Another cool feature with these EatingWell meals is that there is NO PREP NEEDED! Take the tray out of the box and put it straight into the microwave. You do have to put this one back in after stirring, but some of the other ones don’t even require additional stirring later, so that’s pretty swell. I know it’s not the most popular opinion, but I am a huge fan of Brussels sprouts and was very excited to try out this frozen dinner. Verdict — it was a hit! Flavorful, but not overpowering with a good amount of chicken and veggies. The Brussels sprouts were delicious and I enjoyed every part of this meal. It even looked pretty appetizing, which is a rarity with frozen dinners. 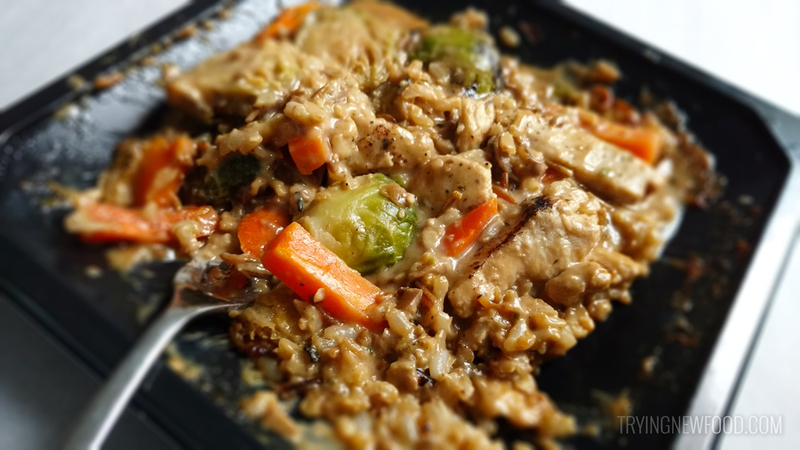 This EatingWell Chicken & Wild Rice Stroganoff is only 290 calories, so after I was done I didn’t feel guilty! I highly recommend trying one of these EatingWell Frozen Entrées. We’ve also tried EatingWell Cherry Port Pork and EatingWell Moroccan Inspired Chicken, so feel free to check those out as well. This looks pretty good! I’d like to give this a try soon.